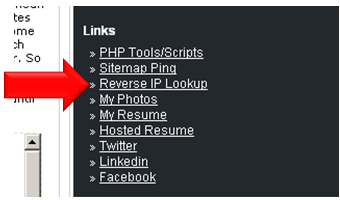 As some of you have probably already noticed I’ve added a new link/script/tool to the site. I have a bunch of these one offs scripts scattered around the internet. I’m currently trying to rope them all into one location. But basically this tool will look ups and reports what other domains are hosted on a particular server. It’s actually fairly simple and works off of an operator that most are not aware of. How it works. Simply just add a domain with the dubb and the tool will do the rest. I capped it off at 30 results. So even if there are thousands the tool will only report back 30 other domains.